So he must be sorry for something else. Like getting caught. Or not being able to do what he is really interested in now, those triathalons. Or, sorry that his legal problems are so complicated that at least a confession of sorts will sort some things out, let things simmer down, start the forgiveness that leads to forgetting in the minds of the American people. I confess that I was so taken by Lance Armstrong and his victory over cancer that I even bought that book It’s Not about the Bike, which will forever be renamed in my head as It’s More About the Dope. But the person who feels uber-dopey right now is me, because I so believed Lance Armstrong, I so thought those French were wrong, I so told my son a hundred times that Lance Armstrong would never do what he was accused of doing. I just could not conceive that he would have the combination of greed, hubris, and nerve that it would take to lie so profoundly, for so long, to so many. Plus, Lance Armstrong seems to have learned something about timing from all those years of cycling: the statute of limitations on perjury has run out on many of the charges that were brought against him….which is extraordinarily convenient for him. So just as his transgressions were not crimes of passion committed in the heat of some pivotal moment, his apologies are as premeditated and calculated, indicating that they are as artfully planned and constructed as his stellar and “winning” career. Part of the reason Oprah Winfrey can reel in millions of viewers to hear Lance Armstrong talk for hours (I am sure I am not alone in that I really wanted him to just stop talking and go away– I mean, how much lack of remorse in the guise of an apology can the average human take?) is that he represented more to us than success in a particular sport. Let’s be honest: most Americans could not care less about cycling. I don’t think most Americans object to this sport, because they are really busy not thinking about it. But we liked Lance Armstrong being the American who was the best at this sport, because most of our sports mentalities are relentlessly local: we want to beat our high school rival, we want to tailgate in Dallas and have our college team win, we want to be the best in the SEC. Lance Armstrong was different in that he could claim victory over those snotty French, those inscrutable Swiss, those “mama’s boys” Italians, and he could do it on European soil. It made you proud to be an American, and it was such a high-class sport: whipping though the Alps, making the French cry, wearing the yellow shirt. It was magic, and we loved it, and we loved Lance Armstrong, who made us feel in the midst of so much anti-Americanism that we were good, we were excellent, we were winners. He was an international figure who made us proud of our nation, and that is why we care about what he did, even if we don’t really care about that particular sport. We care that we are now known as cheaters, because unlike Lance Armstrong, most of us think it is a shame, thus experiencing, well, shame. Maybe he should try it sometime. When I am teaching, I try to draw analogies between the real world and the fictions or dramatizations that we read. Even though I am in the thick of teaching Hamlet (which won’t work at all–he couldn’t decide things, and Armstrong was a controlling bully who called all of the shots) and King Lear (that won’t work either, Lear was having retirement issues, and Lance Armstrong made his mistakes in the midst of glory), I cannot really call Lance Armstrong a tragic hero. Unlike Oedipus Rex, who unwittingly killed his father and married his mother, Lance Armstrong completely had his wits about him when he doped and beat the system for all of those rides that he took us on. Tragic figures are tragic in that they make mistakes, but then realize the magnitude of what they have done and are really sorry about it. Oedipus does not gouge out his eyes for nothing: he wants his past moral blindness to be met with a commensurate literal punishment. This does not seem to be a good fit: Lance Armstrong is just sorry that he has the hassle of apologizing to so many people whose lives have been ruined, and he is betting that if he says it often enough, they might lift that lifetime ban on cycling before he turns 50. It is harder to forgive when the apology seems more a creation of artifice than remorse. The only moment that I recall Armstrong choking up is when he had to tell his son that he should not defend him against doping allegations, because the allegations were true. I feel his pain: I felt really sad too when I had to tell my son Christopher that our great hero Lance Armstrong was a lying fraud, and then I had to come up with a whole explanation for the sociopathy of winning, which is hard for either of us to comprehend as neither of us has felt the thrill of victory in the athletic arena too often. But of course, the sociopathy of winning can be applied to any trajectory: I know a lot of people who would love to be famous writers, but not one of them would be willing to plagiarize in order to see their names in print or win an award. I know a lot of musicians, but in general they just sing or play more in order to get better. I mean, who wants to be Milli Vanilli? If you can even remember who they were. Competition, we are told, should bring out the best in us. 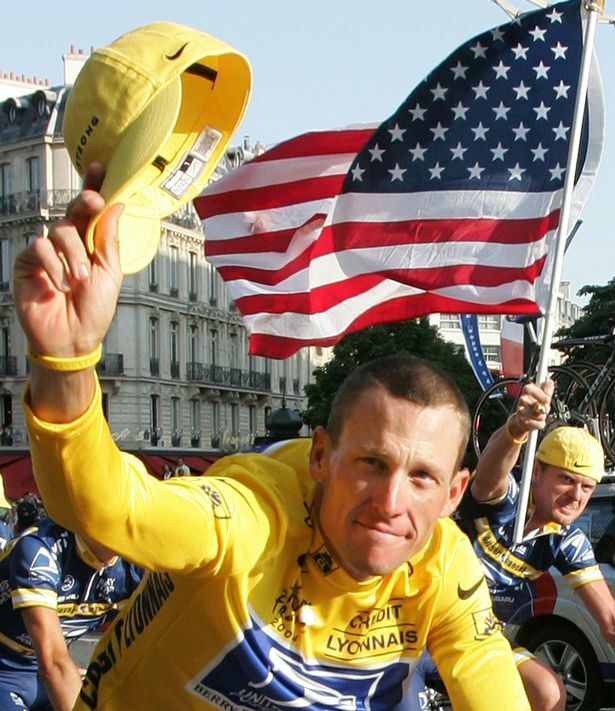 Lance Armstrong stands in opposition to that profoundly American belief. And it is a hard pill to swallow. The toughest part of his interview with Oprah was when he confessed that his wins were “phone ins”–he was so sure of victory through the perfect storm of doping, training, and evasion, that the result of winning was a given. This is when I look at my students and worry–they are in competition every day for grades, and eventually, jobs, and you want to think that there is at least a level playing field to some degree. But I want to tell them, hey, sometimes someone else’s success is just “a phone in,” and there is nothing you can do about it, because you have no way of knowing what is going on behind the scenes. But at least you can sleep at night. One time I was teaching at a school, and a candidate came to interview. It was a tough job market, and we really did not need this person’s field of expertise. This person showed up in red basketball shoes and Elton John glasses, like it was some big joke. I didn’t understand it: lots of my friends from Ivy League schools were pounding the pavement, couldn’t get interviews, were thinking of giving up. I thought: what kind of person dresses like this for a major interview? And then I overcame my blonde moment, and realized, Oh right, a person who has the job in the bag. I didn’t know it at the time, but this person was a friend of an important friend, so I am not sure if this would be the equivalent of doping for a job interview, but he definitely had some enhancements that the other candidates did not have, blah blah blah, and so for this race for a job, in my opinion, it was just a call-in. It happens. Sometimes I wonder about the other candidates, and if they were better, but like all those races Lance Armstrong rode in, we will never know. Sometimes, I wonder what happened to them. So I want to tell my students, there are Lance Armstrongs in every arena of life, but they are just not as famous. But do not let that get you down. The truth will out: sometimes it just takes awhile. In the meantime, think of the amazing people who would never even think of doping, or think about it and still don’t do it. Keep pounding the pavement, keep riding onward, because you might not win the laurels every time, but you will accomplish something, and you can be proud of the way you did it. There is a lot to be said for the fact that you can sleep at night, look in the mirror, carry on knowing that when you do win, it will be for real. This is the thing about Lance Armstrong: he will never know if he would have been able to do it anyway, on his own merits, unadulterated with prevarication and cheating. He will never know. “Honesty is such a lonely word.” And it does seem like everyone is so untrue, especially when they are telling us how so for hours to Oprah Winfrey. But that is okay. We will forgive him, Americans always do. But right now, not one person in America wants to be Lance Armstrong, and the fact that we react that way, reject his hollow words, vow never to stoop so low, actually gives me infinite hope. Americans have not lost their way, even if, for awhile, Lance Armstrong took us for a ride. I must confess that I am tired of Lance, and I am also tired of strident moral outrage. This is a remarkable essay, because it isn’t morally outraged as much as very personally saddened. I think that is exactly the right way to approach the matter, and close the book on it. It is really sad. It is saddening, and fascinating, how successful the lie was because the story never made sense. He did well as a cyclist but never won the TdF until after he was sick. It always seemed like Spiderman to me: he was bit by cancer & became a biking superhero. I could never bring myself to get one of those yellow bracelets & I’ve been surrounded by people wearing them for years. It was no surprise to me when it all came out, but I am shocked at how pissed off I am at the whole situation. Really, really vulnerable people looked to him for strength and hope and he profited from them and then just wasted so much good will. It is really sad. How can he expect to regain public respect and admiration when he has accomplished nothing to earn it? He has wasted his life. Thanks for all the kind words and great comments…I have been thinking about this situation and it may also be a case of “It’s not the crime, it’s the cover-up.” The pressure to dope in the cycling world may be so intense that I really cannot come close to comprehending it. But I think the bullying, lying under oath, and suing people that were correct in their accusations are the things that make it even harder to stomach. And the fact that the Armstrong legal machine was financed in part through hefty endorsements that were given to him by companies that believed him when he denied doping makes it all that more ironic. beautifully written, as always. Perhaps if Armstrong had paid more attention in his literature courses, he could have realized that the reader identifies with the tragic heroes precisely because of their flaws, and keeping this in mind, he could have created a better ending for himself!